Pinnawala Elephant Orphanage is an orphanage, nursery and captive breeding ground for wild Asian elephants located at Pinnawala village, 13 km (8.1 mi) northwest of Kegalle town in Sabaragamuwa Province of Sri Lanka. 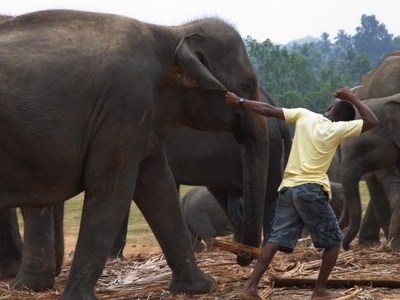 Pinnawala is notable for having the largest herd of captive elephants in the World. 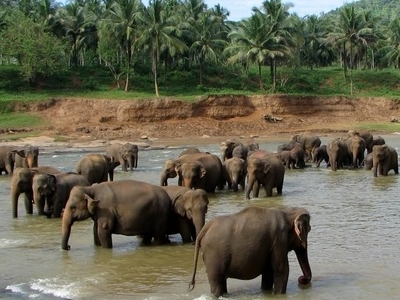 In 2011, there were 88 elephants, including 37 males and 51 females from 3 generations, living in Pinnawala. The Pinnawala Elephant Orphanage was first established by the Sri Lankan Department of Wildlife Conservation in 1975 for feeding and providing care and sanctuary to orphaned baby elephants that were found in the wild. The orphanage was first located at the Wilpattu National Park, then shifted to the tourist complex at Bentota and then to the Dehiwala Zoo. From the Zoo it was shifted to Pinnawala village on a 25-acre (10 ha) coconut plantation adjacent to the Maha Oya River. Tourists can observe the bathing elephants from the broad river bank as the herd interacts socially, bathing and playing. 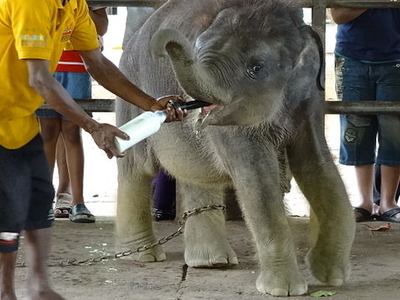 The orphanage is open to the public daily, and all admission fees are used to look after the elephants.Visitors to the park can view the care and daily routine of the elephants, such as bottle feeding of elephant calves, feeding of all other elephants, and bathing in the Ma Oya (River). Here's the our members favorite photos of "Wildlife Reserves near Pinnawala". Upload your photo of Pinnawala Elephant Orphanage! Get in touch with 3 Touristlink members who want to visit Pinnawala Elephant Orphanage or with Vaseekaran Nadesamoorthy, Hasith Perera and 12 others who already have been here.